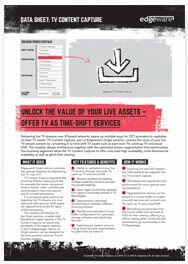 TV Content Capture is part of Edgeware’s origin solution. It ingests your content assets and processes them in the most accurate and optimized way to enable glitch-free viewing. It also segments and synchronizes the incoming streams, aligning audio, video and subtitling streams in a uniqe manner. In addition, TV Content Capture unlocks the value of your live content by converting it to time-shift TV assets such as start-over TV, catch-up TV and cloud DVR. Deployed in a public or private cloud this product offers rock solid availability and elasticity.